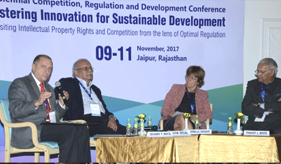 The objective of the conference was to bring research and empirical evidence on two seemingly contentious policy and regulatory issues which are far from being settled: a) the interface between competition and intellectual property rights (IPRs); and b) the role of competition and regulation vis-à-vis disruptive technologies. Alongside this, the imperative scope of innovation, collaboration, partnership, knowledge sharing and optimal resource allocation between different stakeholders, private and public were discussed. The conference objective was to highlight ways in competition and regulatory reforms can be used for achieving developmental objectives, especially some of the challenges that the post-2015 agenda presents - referred to as the Sustainable Development Goals (SDGs). 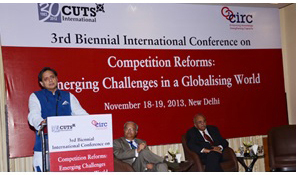 3rd Biennial Conference: "Competition Reforms: Emerging Challenges in a Globalising World"
The conference was another attempt to forge convergence by putting on display different approaches for rationalising, formulating and evaluating economic regulation as well as defining stakeholder participation in such regulation. 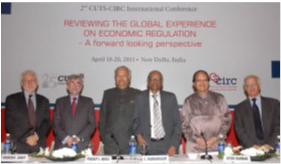 The aim of the conference was to stimulate research and thinking among governments and other segments of the policy community on the future agenda of regulatory reforms. The Symposium was organised to deliberate on research findings that emerged in the first cycle of the “Competition, Regulation and Development Research Forum (CDRF)” Project. 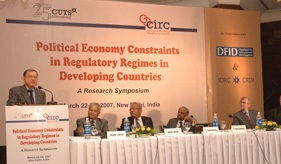 Research papers focusing on political economy and governance constraints that developing countries face in implementing their competition and regulatory regimes were discussed at the symposium.